Do you know the apple man? He was born John Chapman on September 26, 1774, in Leominster, Massachusetts. Of course most of us know Chapman as Johnny Appleseed, the American pioneer who planted large numbers of apple trees along the early frontier. Did Chapman really wear a tin pot as a hat, a coffee sack as a shirt, and no shoes? I like to think so! To celebrate Johnny’s birthday with ease, CLICK HERE. 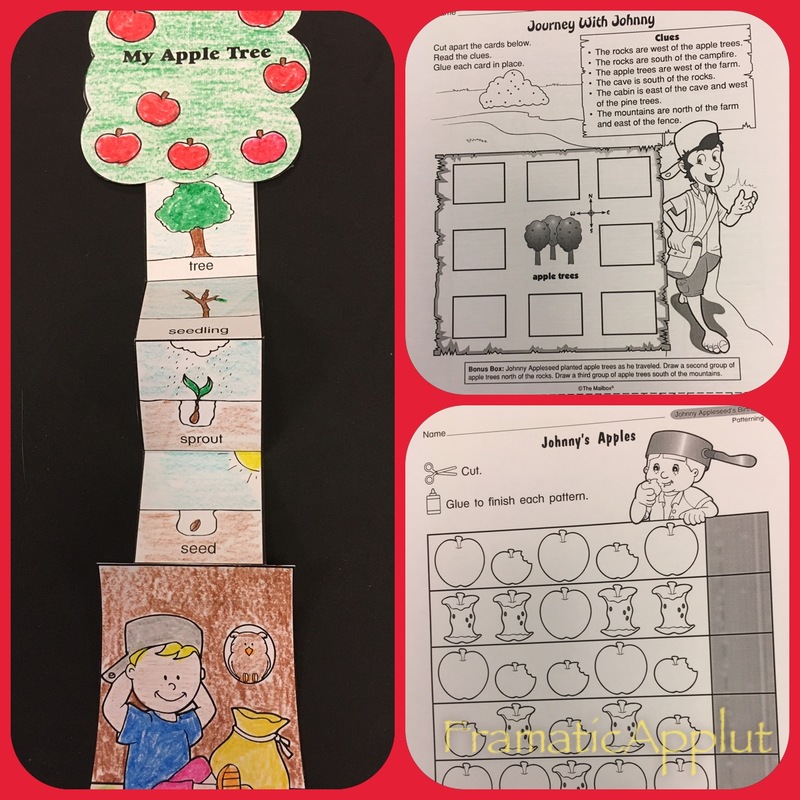 You’ll find the activities pictured, along with writing prompts, apple crafts, worksheets, and more. And here’s a nifty tune for celebrating Johnny’s actions too. Thank you, Johnny. Thanks for red ones. Thank you, Johnny. Thanks for green ones. Thank you, Johnny Appleseed. Thanks for yellow apples, too. For the apple seeds you planted Thank you, Johnny, for the apples. That grew into apple trees For the apples that you grew. Does anyone remember the Johnny Appleseed savings accounts for kids? There was a bank in the town I grew up in who had the Johnny Appleseed program, and my siblings and I were a part of it. I believe there are some banks that still have the program. It teaches kids the importance of saving money as well as spending money in a good way. Thank you, Mailbox, for reminding me of Johnny Appleseed. And thank you for the apple activities! P.S. I enjoy caramel apples. I like apples plain, dipped in caramel or in a pie. I made some delicious Vanilla Apple Muffins yesterday for breakfast. Some of my favorites homemade organic apples healthy recipes are: Gluten-free apple galette,gluten-free oat cinnamon and nutmeg apple crisps, Greek yogurt apple cinnamon bread,and of course spiced hot apple cider… all healthy and delicious.